Multiple sclerosis (MS) is a chronic degenerative disease. It affects the central nervous system and causes inflammation, muscular weakness and a loss of motor coordination. As MS progresses, the patients typically become permanently disabled. In extreme cases this can be so severe that it causes patient death. The US National Multiple Sclerosis Society estimates that 200 people are diagnosed with the disease each week. MS most often strikes individuals between 20 and 40 years old but has been seen appearing across the age spectrum. Because of the symptoms of MS, it is recognized by all states as a qualifying condition for medical marijuana. Efforts have been made to protect medical patients from federal punishment. Although marijuana is still federally illegal, legislation passed in 2015 clarified that the federal government would no longer use federal funds to enforce federal marijuana laws. This included states that permit medical marijuana use. The legislation was an effort to reduce confusion about federal intervention in states that legalized use. The directive effectively overturned the Supreme Court’s 2005 ruling which said the federal government could prohibit and prosecute the possession and the medical use of marijuana. The court also ruled that state laws did not protect medical users from prosecution. The legislation was careful to ensure that if White House later chooses to reverse the federal directive, it can. Cannabis isn’t the only treatment out there but it is one of the best. Most agree that better therapies are needed to treat the symptoms of MS (since there is no cure) which include pain, tremors and spasticity. Current pharmaceutical options may not sufficiently treat the symptoms of MS but there are about the benefits of marijuana relative to its side effects. The National Multiple Sclerosis Society is one of the biggest non-profit names in MS. Over the years, they have proven to be allies of patients as they fought to help promote awareness and access to new and alternative treatments. We know a lot about treating MS with cannabis. There have been tons of studies on effects of cannabis on cognition / cognitive function in people with MS. Two of which stand out as examples of the common outcomes for treatment with cannabis. While both were published in the journal Neurology, the first was in 2012 and the second was 2014. In the 2012 study, 25 MS patients who regularly smoked or ingested street cannabis were tested and results compared to 25 MS patients who didn’t use cannabis. The users were tested at least 12 hours after last using to minimize intoxication. The 2014 study used 20 MS patients who smoked cannabis and 19 who didn’t. They matched them based on demographics and neurological variables before undergoing magnetic resonance imagining(fMRI). The scan revealed brain activity while performing tasks and tested their working memory. As memory tasks became more demanding, cannabis users performed increasingly worse than their non-using counterparts. Cannabis users performed significantly worse on measures of information processing speed, working memory, executive functions and other cognitive functions than non-users. In addition, they were twice as likely as nonusers to be considered cognitively impaired. The study showed that cannabis can worsen cognitive problems in MS.
Cannabis doesn’t have to be smoked to be medically beneficial. Participants in another study with stable MS were randomly assigned to receive oral cannabis extract. The test group consisted of 144 using cannabis and 135 on a placebo. Participants reported their perceptions of changes in muscle stiffness. The administrators tested participants both before and after 12 weeks of treatment. They found that muscle stiffness had improved almost twofold in the group taking cannabis compared to placebo. Patients also reported improvements in body pain, spasms and sleep quality. Contrary to popular belief, using cannabis did come with some negative side effects. While only a percentage of the population, the study noted increased risk/frequency of urinary tract infections, dizziness, dry mouth and headache. These side effects should not be news to anyone who has used cannabis before and the team reported observing no new safety concerns. No discussion would be complete without mentioning Nabiximols. Nabiximol is an oral spray derived from cannabis marketed as Sativex by GW Pharmaceuticals. Available in 15 countries and approved in 12 more (excluding the US), Sativex is used to treat MS-related spacity. It significantly improved spasticity in a proportion of the population with MS who had been identified as likely to respond to the therapy. The Journal of Neurology, Neurosurgery & Psychiatry reported on a long term study on the safety of cannabinoids in MS. 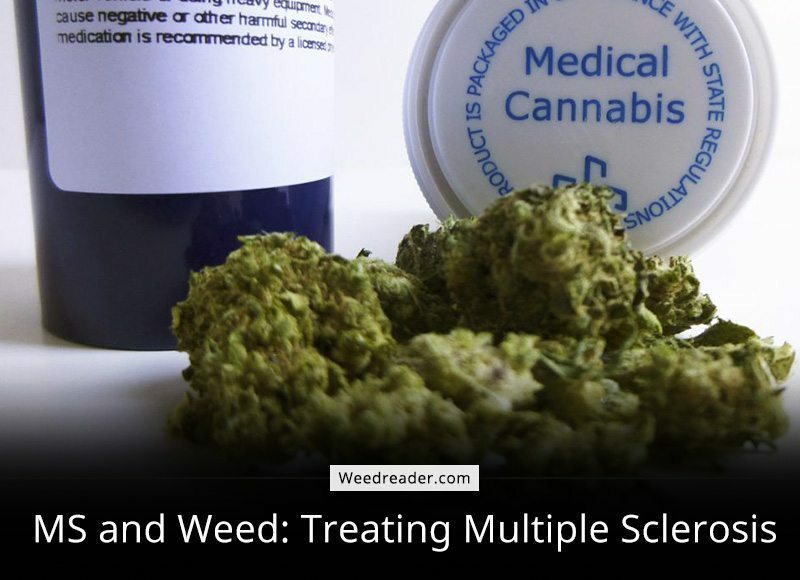 The study used 630 subjects with stable MS and muscle spasticity from 33 centers around the UK and randomly assigned some to receive oral THC, cannabis extract or a placebo. Over the course of 15 weeks, the oral derivatives did not provide objective improvement to the subjects according to a standardized assessment tool. When it came to subjective improvement though, there were significant improvements in spasticity and pain. Even though the tremor and bladder control symptoms did not seem to respond to the treatment, people felt better. A study has to be ready for some complications. Basically, when participants report feeling improvements that cannot be confirmed by the physicians, there is a problem. This could be dealt with normally but the Nabiximol study became unblinded. The side effects of THC made it clear to patients they were receiving the active drug rather than the placebo. In another study published by Lancet Neurology during 2013, they tested orally administered dronabinol. The test group consisted of 493 patients with 329 receiving at least one dose while 164 received at least one dose of placebo. The results showed that dronabinol had no overall effect on MS progression. Do you have MS and treat with cannabis or know someone who does? What have your experiences been? Do you prefer using a natural flower or synthetic pharmaceuticals? Let us hear about your struggles and triumphs in the comments below. Thanks for reading. In using it for my husband, who is in late stage ms with severe cognitive issues, I find that his cognitive ability actually improves significantly. My own “theory” in observation is that the weed will close down some of the brain circuits allowing him to focus on one thing vs. trying to process multiple inputs in the natural environment. His mood and sense of humor are elevated and he is able to follow conversation easier. This flies in the face of what you have found here – however, testing 12 hours later is not an indication as the weed exits the system within hours as far as immediate effects. ….12 hours later he is back to struggling to make sense of much of everything….. It is wonderful to hear how cannabis helps your husband. It is amazing how differently two people can process the same chemicals, much less the entire population. That is why studies like the ones above are so important. Our brains are incredibly complex and sensitive organs and they don’t always work the way we think. Your experience shows how much more research is needed on this subject. Thanks for sharing your story with us. At first , I was fine with no outward concerns. The withdrawal from Pregabalin (Lyrica) was fairly intense, hallucinations, mood swings, weird feelings, anxiety and irritability. After a few weeks, I started to get the leg spasms at night that were the precursor to me getting treatment. First Baclofen, which didn’t work and then Tizanidine which works after a fashion, mainly making everything foggy. A few nights of the spasms and I tried Sativex again, that was the only thing that worked last time. My urgency to pee has reduced, my sleep has vastly improved as has my mood. I’ve very grateful for Sativex, it has made a lot of difference to my quality of life. It doesn’t work for everyone though, if you can try it then for sure do so. The side effects of pharmaceuticals scare many people away. Unfortunately for most, there is little alternative. It is great to hear how Sativex helps you manage despite the problems from other treatments. Thanks for sharing your experience. 1) Noon: THC pill. The best I’ve found (in terms of consistency of effect) is a 25 mg THC oil capsule. I’m currently trying a larger capsule with decarboxylted (sp?) weed and oil mixture. Its effect is not as consistent as the THC oil capsules. So far, the producers haven’t indicated what strain is used for these capsules ( Indica or Sativa), so I’m not sure which is best. For daytime use, Sativa would normally be better. 2) Afternoon: THC Sativa tincture under the tongue. Effects are variable for the same bottle, it seems. More experimentation required. When that doesn’t do the job, I also vape some high THC Sativa weed. 3) If the daytime doses work properly, then I don’t need any more until bedtime. Otherwise, I take more Sativa tincture or dry weed or shatter during the day. 4) Before bed: I vape or smoke a 9/9 (%THC/%CBD) dry weed produced by my legal supplier (Cannimed). It usually gets me to sleep, but if the pain is really bad, I use whiskey. I may have a marijuana brownie before bed. Given the huge variety of strains, sub-strains and product forms, I still have a ways to go before I find the best regimen for my symptoms (which vary) and the best products to use, depending on my symptoms of the day. I feel I’m still a ways from finding the best combinations of products, but as I’ve come closer I’ve found a huge improvement to my quality of life. PS: I no longer drive, so I have more opportunities to try different combinations than other people might. Also, there is a lot of information on the web about strains, sub-strains, products, etc. One good source is Leafly.com. Trying out the different treatments (or mixing and matching like yourself) is how most patients learn what works for their body. It’s important to remember that there is more than one type/strain/method of cannabis consumption and each work differently. After my Multiple Sclerosis diagnosis 2 years ago, i stopped all the Multiple sclerosis medicines prescribed due to severe side effects, and decided to go on natural herbal approach. My primary care provider introduced me to Rich Herbs Foundation and i immediately started on their Multiple Sclerosis herbal formula treatment, this herbal treatment has made a tremendous difference for me. My symptoms including shaking, muscle weakness, fatigue, mood swings, numbness, double vision and urinary retention all disappeared after the 4 months treatment! Their website is w w w. r i c h h e r b s f o u n d a t i o n. c o m. Its just amazing! I was having joints pain in both hands inside and outside and muscle weakness due to multiple sclerosis (MS). I was falling a lot, I had headaches and lightheadedness. I couldn’t keep myself balanced, and walk with a tremor like I cannot control my steps. The amantadine hydrochloride (Symmetrel®) and modafinil (Provigil®) did very little to help me. I still didn’t feel any better, Since the original diagnosis, My stiffness has slowly increased. October 2017 my brother in-law told us about Natural Herbal Gardens where he ordered herbs that effectively treated his Parkinson’s. We ordered their multiple sclerosis herbal treatment after reading alot of positive reviews, i am happy to report this multiple sclerosis herbal treatment reversed my (MS) condition. My quality of life has greatly improved and every one of my symptoms including muscle weakness and tremors are gone. Their official web official website is ww w. naturalherbalgardens. c om. I can now go about my daily activities, I will be 64 soon. Five years ago, I went numb from the waist down. After quite a few MRI’s, spinal tap, I was diagonsed with Multiple Sclerosis. I was on Avenox for almost 2 years, i had 1 year of monthly steroids IV, had to stop due to hip pain. Through my physiotherapist i learnt about a MULTIPLE SCLEROSIS HERBAL TREATMENT from R.H.F. (RichHerbs Herbal Foundation) and their success rate with the treatment, i immediately started on the MS treatment, i experienced decline in major symptoms including hand tremor, back pain, difficulty walking, muscle paralysis and weakness, uncomfortable tingling and burning, fatigue, urinary retention,double vision, slurred speech difficulty swallowing, numbness. Visit ww w. richherbsfoundation.c om. I knew that a positive attitude is everything and to just believe, I’m in control of my life again….